A criminal case may begin after police make an arrest and then present information to the prosecution for criminal complaint, or the complaint may issue first followed by an arrest warrant. If a warrantless arrest is made, the officer must prepare an affidavit in support of a criminal complaint and present it to the Court and prosecution. Prosecutor(s) appear before a grand jury of 16-23 people to establish probable cause that a person commit­ ted felony offense(s). If the grand jury agrees, 12 or more persons vote to issue an indictment against the accused. A criminal information is a document charging the defendant with one or more crimes. This document is filed with the defendant’s consent and normally as part of an agreement to plead guilty. This is a defendant’s first court appear­ance when he is advised of the rights to remain silent and to legal counsel; elects counsel (private or public); learns of the charge(s) and potential maximum punishment; and an initial bail determi­nation is made to either release the defendant on conditions or hold him/her without bail. This court appearance is where a defendant is again advised of the charge(s) and potential maximum punishment, elects counsel (private or public), enters a plea of not guilty, and a bail determination is made to release or hold the defendant. 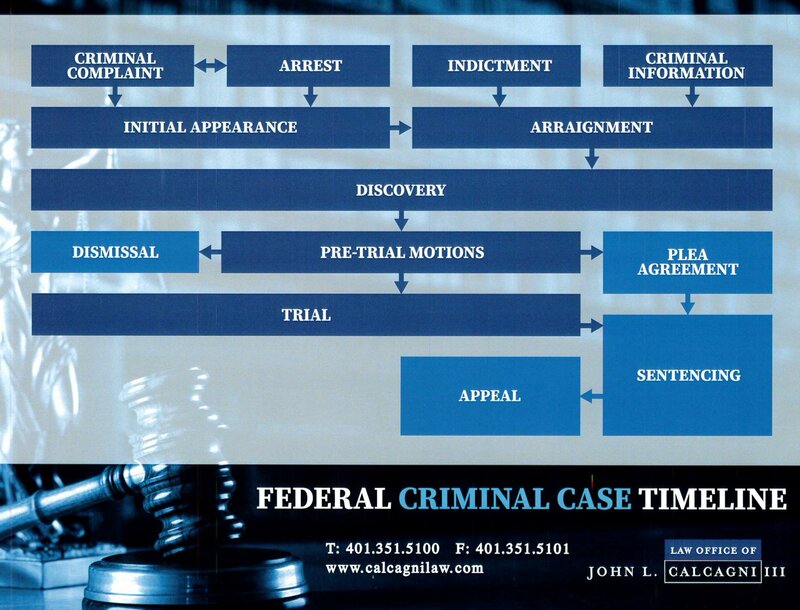 Arraign­ments occur after the filing of either a criminal information or an indictment. This refers to obtaining evidence or information in support of the charges. Typically, the prosecution provides the defense with evidence in its possession in support of the charges. A prosecutor has a continuing obligation to provide the defendant with documents and other information it has and may obtain about a case. The prosecutor is also required to provide the defense with evidence that may hurt its case, called exculpatory evidence. If the defense has evidence it may offer at trial, it too must disclose such to the prosecution. During discovery, the defense may also conduct its own investigation to include interviewing witnesses, working with investigators, visiting crimes scenes, and consulting with experts. These include motions to dismiss charges or suppress evidence, constitu­tional challenges, motions for a bill of particulars, motions to strike and motions in limine, and severance motions. The most typical pretrial motion is a suppression motion. In these types of motions, the defense moves to suppress evidence, or to prevent the government from using it at trial. If successful, certain pretrial motions may lead to dismissal of charges or even the entire case. This may be done by the prosecu­tion or the judge by filing a motion to suppress or lack of evidence. The government may offer the defendant a plea deal to avoid trial and perhaps reduce his exposure to a lengthier sentence. When the defen­dant admits to the crime, he agrees to guilt and to be sentenced or punished by the court. If a defendant pleads guilty, he waives the right and the many rights to come with a trial. If a plea is accepted, the next step in the process is to prepare for a sentencing hearing. Trial is a structured process where evidence is presented to a jury of 12 or sometimes a judge sitting without a jury. Once a jury is selected, the parties normally make opening statements to outline the evidence expected during trial. The govern­ment presents its witnesses and evidence. The defense may challenge this evidence and cross-examine all prosecution witnesses. Once done, the defense may present its own evidence or witnesses, if it chooses. The defendant may also testify if he chooses, to remain silent, consistent with his right to do so. If the defense present any evidence or witnesses, the prosecution has equal rights to challenges and cross-examination. After all evidence is presented, to include possible rebuttal from the prosecution, the parties make closing arguments for and against guilt. The jury then decides the case and must conclude, unani­mously, with 12 votes for convic­tion or acquittal. Sentencing occurs after convic­tion, whether by plea or after trial. When imposing sentence, the court considers the maxi­mum possible punishment, the advisory sentencing guidelines range, recommendations and sentencing submissions of the parties, and factors under the law listed in 18 USC § 3553. A defendant may appeal either a conviction or sentence by filing a notice of appeal within 10 days from the date judgement is entered. By filing an appeal, a defendant asks a higher court to review what occurred in the trial court to determine if any error was committed that violated their rights.